Track your Nutrition and Workout Plan with this easy to use app. Add colored containers for each meal while seeing the remaining portions for each container you have left. Also track the amount of water you've consumed for the day. Each day has the specific day's workout so you don't have to remember which workout you're on. Keep track of your transformation with the ability to enter your body measurement for both before and after your fitness program. A Fast Track is also included which lists out the foods and containers to eat for each day. Check them off as you complete each meal. Once you finish the fitness program, maintain your weight with the maintenance tracker. Calories and portions are automatically adjusted. 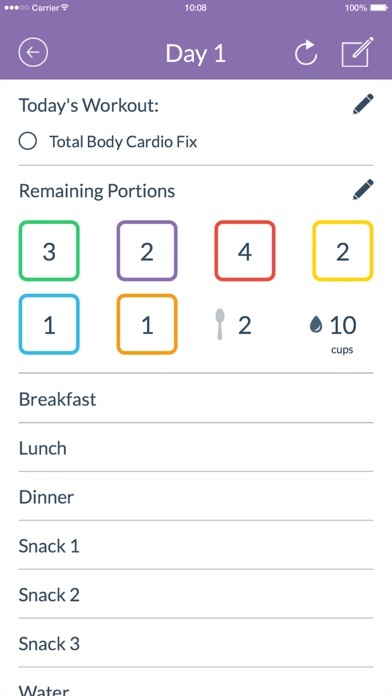 Track your portions and see what's remaining just like when you were on the daily plan A container reference guide is included so you know what to put in each of the colored containers. Nice for tracking the containers. I wish there was a graph for the containers and/or exercise to enjoy the satisfaction of succeeding. Really like this app so I can track as I go! I write out my meal plan every week but it’s nice to have it with me so I can keep up especially with the water! My only issue/request is that the app allows you to log more than one workout for a day. Sometimes I do 2 workouts to make up for a missed day or just feel like doing 2. The book says I should be on the 2500-2890 food plan when using 21 Day Fix... The only way I can get the containers in the app to match what the book says is to select 21 Day Fix Extreme in the app which isn’t the program I’m doing... Looks like the original 21 day fix plan has since been updated with higher nutritional value plans but the app was never updated. I would love to be able to put decimals in for my measurements. I do love this app and agree with people who say it’s a necessity to stay on track during your 21 days. The only thing I’d change is the order of the meals/snacks. I really love this app but I’m breastfeeding and this app doesn’t account for the calories burned. I love this program and the app lets me remember and keep track of my daily intake! I couldn’t be happier with Beachbody and this app just takes it one step further! I just started using this app to help me with my program but I noticed the countainers are off for meal plan A the guide says you get 4 greens and 3 tablespoons but the app only has 3 greens and 2 tablespoons. Anyway to fix it so I’m not always over? I did the 21 day fix 3 years ago and I can say it actually works. I went from 300 to 260 in about 3 months. I think this is the most realistic way to lose weight, it’s not stressful deciding on what to eat, it doesn’t limit you on where you can go if your in a hurry, and most of all Beachbody has made it easy to follow. I used the Shakeology as a protein every morning. I still drink it occasionally. I should note that I didn’t work out the first month or so because I have a crazy work schedule. But I seemed to drop the weight still. Which was nice! Thanks Beachbody! 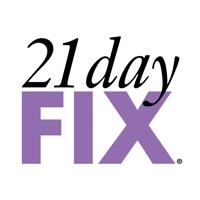 I just finished my first round of 21 Day Fix and this app was extremely helpful. First the pros: has a tracker for beginning and ending weight & measurements, easy way to track your containers, and easy access to food lists. Cons: measurements can only be entered in whole numbers which is inaccurate and no place to add what you actually ate. All in all this app is extremely useful for keeping track of your progress. I would not be able to follow the meal plan without this app! It makes it so much easier to track what you eat all day! I love this app and have used it through a few rounds. I have 5 more days in week 3 and it stopped working today. I contacted Beachbody and they no longer support it. You have to buy the Challenge app or BOD instead. Huge disappointment! This app is everything! Tracking what you eat and how much ensures proper nutrition & control without guesswork. You can choose to maintain, lose a few pounds or get bathing suit ready fast! Highly recommend. The app is stuck and I’m on day 7, please help! The maintenance has me at 145 lbs, I want to loose so calories are 1245 per day. Are the containers showing accurate? Being able to write what you had for each meal would be a HUGE improvement! Also maybe a meal planning system so you can prep to know what you’ll have for each meal before hand. Otherwise GREAT APP! This app has all the features I would require if I had been an analyst on the team. It is very helpful to be able to track meals on the go. There are also the additional features to track weight and workouts within several different meal plans. Thank you Beachbody. I love this app, and, as other reviewers have mentioned, I’m not sure I would have made it through without it. Having the ability to easily track my portions within a few clicks made it a no brainer. My biggest complaint is that the body measurements tab only accepts round numbers, no decimal or fractions. It would be much more accurate results of your measurements if this were updated/fixed. So easy to use and helpful! I really am loving the ease of tracking my meals throughout the day! The first three times I had done the 21 day fix (several years ago), there was no app. The only improvement I would like to see is on the measurements. 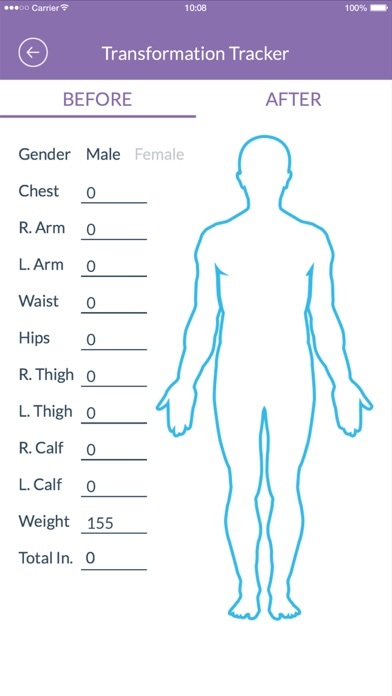 Some of my body measurements were fractionated and the app only lets you place whole measurements. This is the reason I scored it a 4 rather than a 5! This app is so helpful in keeping track and having success in my fat loss goals or just keeping me from gaining fat. Love this app. It is helpful in keeping track of what I eat, and in quickly looking up which category a food fits into. This is the perfect app!... Keeps you on track throughout the day! I absolutely love this tracker. It makes everything so simple. I realize this was made for 21day fix but I wish there were options for you to choose other Beachbody programs to track the daily workouts with it. Overall, it is a great app and I’m grateful to have such an easy way to track my containers and an easy access list of the foods for each container. I do like how simple the app is. There were no complications on getting started and all the information needed to complete the 21 day fix. Great and easy way to know what you are allowed to eat and to keep track on a daily basis. I love this app and corresponding containers. I have been using it for a few months now. I feel great! Much better energy! This app makes eating well simple. I just started using the app and I think it is very helpful. There is one problem. When typing in notes on the note screen it does not allow you to see anything below my keyboard. I have to keep exiting put of the page and reenter just to see the notes below my keyboard. If the ability to scroll was available that would be useful. Other than that I like it. I’m not sure I would have survived the 21 day fix without this app. I was glad to have it so I could check off my containers throughout the day and see what containers I still had available. The app also tells you what workout you should be doing that day and helps you track your water. I love how the app gives you the list of approved foods for each container. I referenced that a lot. My only complaint is that sometimes I would check off that I had done the workout and later it would be unchecked again. If I rechecked it then it stayed checked after that. I’m not sure why it did that, but it was a minor problem. Everything else was super helpful!! Just some suggestions- could you make it so the app links to the BOD app? It would be cool to be able to click on the workout you are supposed to do and be taken to it. It would also be great to have some recipes on here. Especially for 21 day fix dressings. This app is so simple and convenient to use. Each meal I track what I eat and it gives me a clear view of what I have left for the day. Eating clean with proper portions along with a daily workout is truly a life changer! Simple. Easy. No excuses design. I’m very happy with this app and program! I would like to see a female when I click woman and it would be helpful if we could use decimals to track progress. Doesn’t display the correct weight. I started over and I don’t know if it’s displaying the correct containers or not. Recently the decimal point no longer works in the measurement tracker. Very annoying. Otherwise great app! It’s been a year or more since this app has received an update. Some basic housekeeping is due. Input for measurements and weight are buggy. Say, you put your starting weight as 300, if you delete all the numbers the 3 will stay so you have to put in 3100 and then delete the 3. Then on your “today’s weight” it will not update to reflect your new starting weight, but the 300. Same issue occurs with the body measurements including with the decimal point. After every round, I just end up deleting and reinstalling the app and reentering my new information so my correct weight and measurements are reflected. It’s a bit irritating but, like I mentioned, usable. I’ve messaged BB about it through various means and have received no response. So this is just a heads up to others. Please modify this to work in Apple Watch! This app has been my lifeline and the reason I have been successful. It’s easy to use and gives you all the information you need to follow your meal planning and keeps you up to date with the correct workouts. Highly recommend it! Needs an update. This app runs slow, and doesn’t fit newer iPhones. It does the trick for basic tracking of food containers and exercise, but it could be better. Would love it if you could share daily entries to social media and email. The app is great, but it would be a huge improvement if they added different moderators for the calorie bracket calculator such as a different calculation for those that need those extra 500 calories for breastfeeding, which puts their caloric intake in a different bracket than if they weren’t. Together with that, the calculator should be able to take into account if you are trying to maintain, lose, or gain weight, without having to manually add or remove container. Just a suggestion that would simplify the app a lot for those of us that need to modify something! I absolutely love this!!! It helps me stay on track and eat healthy. It’s also my go-to whenever I’m needing the find out which veggie is healthier than the other. It definitely helps me! Absolutely love this and wish I’d discovered it sooner. I do wish it would show me which days I checked as having worked out as I go, or a summary at the end. Unless it does already and I just haven’t seen it?